Technorati Authority and Top Tags Widgets. ~ The Blog Doctor. You are here: Home > Technorati > Technorati Authority and Top Tags Widgets. Technorati Authority and Top Tags Widgets. At first glance Authority appears to replace the old 'Number of Blogs linking to your blog' index but further clarification is still awaited. The bigger the number the better is your 'Authority' since it means that more blogs are linking to your blog. Your Rank is the other way around : The lesser the number means better rank since it means that many blogs are ahead of your blog in the number of other blogs linking to them. 35 VIEWERS CLICKED HERE TO COMMENT ON THIS POST. ADD YOUR COMMENT. i have faved u in technorati..
thanks for every thing that you have done for dummies like me. i have some problem about technorati about my blog http://mydzi.blogspot.com . which is link by othr blogs or with other webs but in technorati authority there is no (0)authority. showing can you plz solve this problem. in the other side i have anthor blog http://dzibeads.exteen.com has authority. my name is Grteaand im from Germany, more exactly Berlin . Now i "found" your Blog and i will start q small question . maybee youfind some time for that and give me a feeback via email ? How can i "deleted" the BLUE blogger banner in the head in my blog . i dont know where the code in my template . . .
i hope you know what i mean . Hi vin thanks for your answer. i have tried as you have said in older post. what i am curious about is there are 18 links to my blog but in tecchnorati.com my blogs rank(or authority)is still '0'. i remember, In one post you said that even 1 link connected to your blog is make big difference (about 35%) and here i have links in my blog but does not show in Technorati Authority widget . That post was about the old system. Since then Technorati has introduced the new Authority Index. The difference I had shown occurs in Technorati Rank. Then I tugged more of my older posts, but –to my dismay, those new tags failed to appear on the tag cloud! I decided to wait for a day, in case Technorati has some delay in the refreshing, but still no new tags!! I went in the Layout Dashboard and deleted the widget, saved the new layout and then again re-inserted the widget… but yet again nothing!! This is a great site and I have learned alot. I have added you as a fav. on technorati. wondering if you could return the favor, I also posted a link on my site to you. Keep up the great work. Have a great day. Which blog do you want me to add to my favorites? i am a regular reader of ur blog & ur blog helped me a lot. i hv one question - in my technorati, NO AUTHORITY is showing, what can i do to add authority. i hav already added 3 blogs to my fav . u & me exchanged technorati fav. its 0 :( ...hw do i increase it?? When high ranking sites in the same subject that your blog deals with quote your blog and link to it your blog authority increases. For this you have to add original and useful content which attracts attention from other bloggers in your field. With my authority being 2, how long will it take for the Top Tags to appear? Also, do you recommend using this in place of the blogger label list if I am looking for something more dynamic? Technorati Authority depends on how many backlinks you have got from other blogs. It is not related to your labels. You can use the Blogger Label widget and your labels will still be indexed by Technorati since the rel=tag is present on them. The Label Cloud widget just shows your viewer at a glance what are the most talked about subjects/topics in your blog. You have two blogs listed in your profile. Which of these are you referring to? Sorry. I want to get it working for the Super Kawai Mama blog, I use the other one to test out all these widgets before I put them up live. 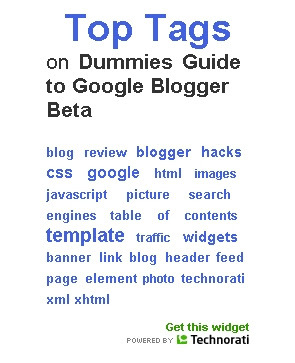 I've followed all top tags widget procedures on you blog, but it's failed. The message was as follows: "we do not currently have tag for this blog"
What's the problem? could you help me to fix it? I really like the top tags widgets. I have revised as per your advice. You have only four posts! Create more posts and tags. You can see the tag cloud in the sidebar on this page. Authority not only depends on how many are linking to you but also their own authority as well! Do not worry too much about authority and page rank. Concentrate on adding more content and building up your traffic. shows 0 reactions to your blog. This means that the blogs linking to you have not been indexed by Technorati OR their links are the NOFOLLOW types. In the second case you can do nothing. In the first case get the permalinks of those posts which contain link/s to your blog. Then ping those posts at Technorati.